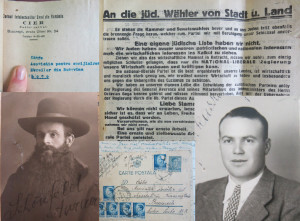 Clockwise from upper left: Letterhead from Circle of Jewish Intellectuals in Romania addressed to the Association for the Support of Jews from Bukovina; Bukovina election sheets from the immediate pre-war years; Moise Farkas, lumber specialist in the Saxon town of Sch äßburg/Sighisoara; Postcard addressed to the Association of Jews Deported to Transnistria; Rabbi of Straßburg am Mieresch/Aiud, Transylvania (Saxon town), 1943, from a wartime application to be exempt from forced labor. Among other locations, Dawson’s work has brought her to the archives of the Communist secret police (CNSAS), the archives at the Center for the Study of the History of Jews in Romania (CSIER), and the central branch of the National Archives, where two extensive collections contain, among other items, countless folders of material related to the communities of Bukovina, in particular deportees to Transnistria. Dawson is currently surveying material at the Ilfov National Archives. Located on a military base, this repository was recently appointed the central depot for material evacuated from northern Bukovina at the end of World War II. The Bukovina collections found here, often highly fragmented, are virtually unknown to researchers. Due to their location on a military base, heightened security measures are in force—even visits to the restroom must be made in the company of archival staff. There are over 100 collections of material originating from northern Bukovina (once part of the Austro-Hungarian Empire, Romanian during the interwar period and part of World War II, today Ukraine). The collections range from Austro-Hungarian-era school records from villages throughout the region to war-time court files from the central Czernowitz appeals court. 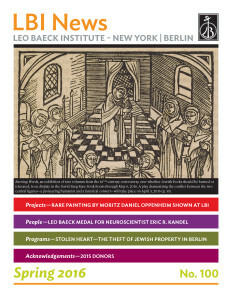 By facilitating access to these collections, LBI is paving the way for ground-breaking research on regions and topics which for all intents and purposes have been closed to scholars until now. LBI’s Romanian archival survey is a Yerusha Project, supported by the Rothschild Foundation (Hanadiv) Europe.